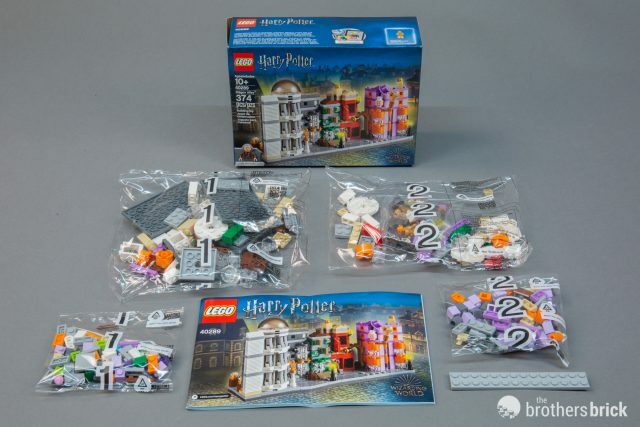 Diagon Alley comes in a small box, tightly packed with two sets of numbered bags. 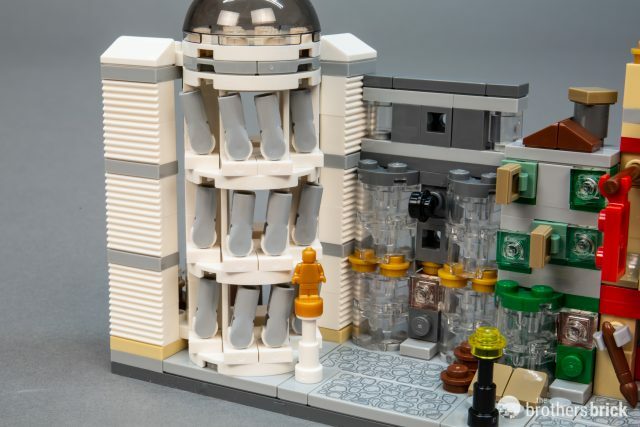 The instruction booklet is folded inside, with 62 steps spanning 72 pages. A single 2×14 plate hangs out by itself loose in the box. 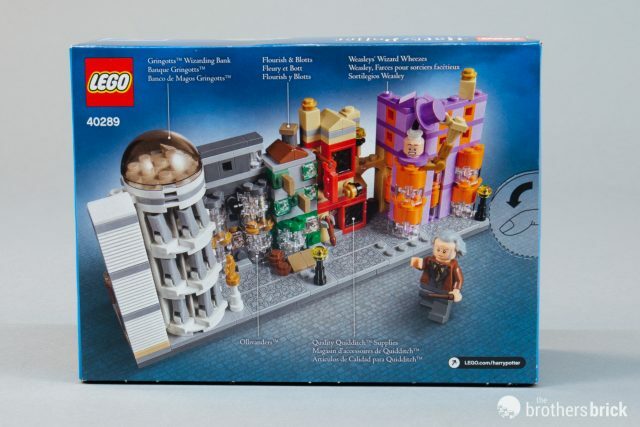 The back of the box features a closeup of the street scene, with callouts explaining what each structure represents. 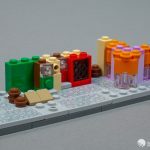 Small freebie sets like this tend to feature pretty basic building techniques and standard parts, resulting in a quick build. 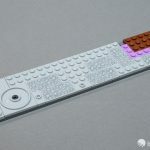 But LEGO design teams have really been stepping up their game in the last few years, and that’s beginning to show even in peripheral sets like giveaways. 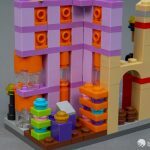 We saw this last year with the offset build techniques in 40254 Nutcracker, and that’s the case with this latest giveaway as well. 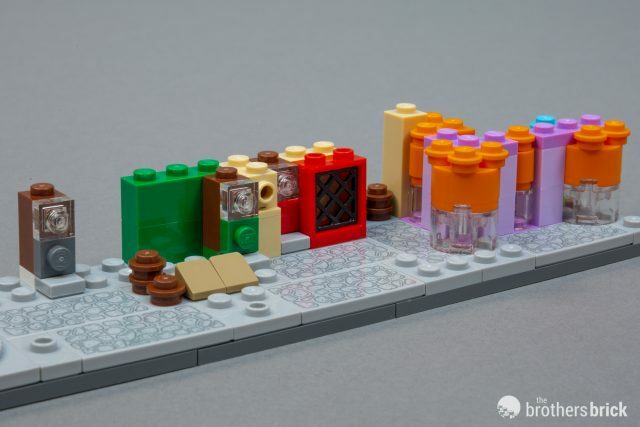 The build begins by combining plates and tiles for the base of the alley. 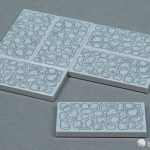 Right away, you’ll notice that the set includes some fantastic printed tiles with cobblestone designs. 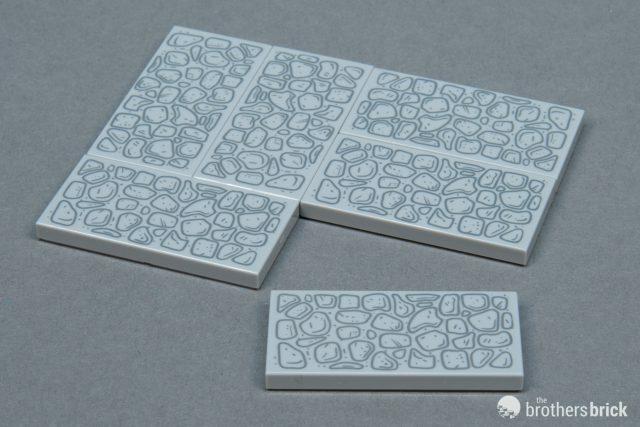 With six of the tiles, this freebie is already attractive just for this unique part (only available at this point in this set). 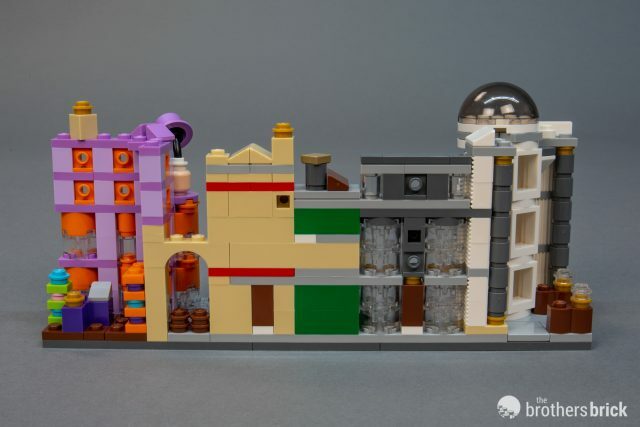 The first steps add the ground floor details of the various shops in Diagon Alley, with lots of headlight bricks to attach later details. 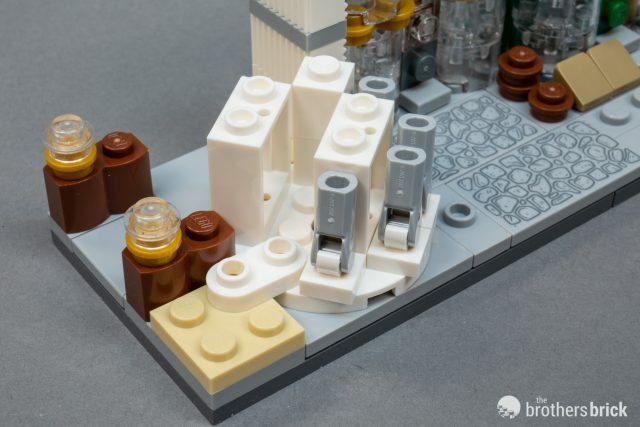 Gringotts Wizarding Bank uses the turntable built into the base of the alley to place the entrance at an angle. 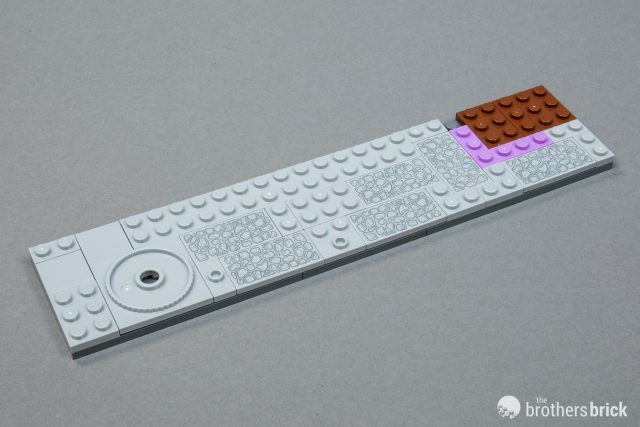 A rounded 1×2 plate secures the circular structure to the base. 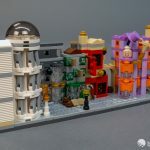 At the end of the first set of bags, the ground floor has recognizable shops and other magical businesses, though more detail is to come in the next bags. 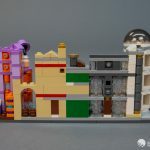 The second half of the build adds the missing details to complete the street scene. 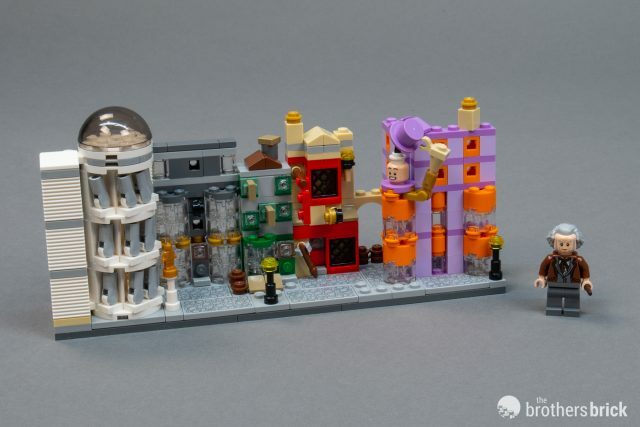 From left to right, 40289 Diagon Alley features Gringotts Wizarding Bank, Ollivanders wand shop, Flourish & Blotts bookstore, Quality Quidditch Supplies, and Weasleys’ Wizard Weazes. 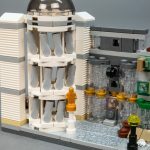 Each shop features unique details to make the building recognizable from the movies. 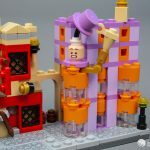 The Weasley twins’ joke shop has the head of one of the boys tipping his top hat above the corner window. 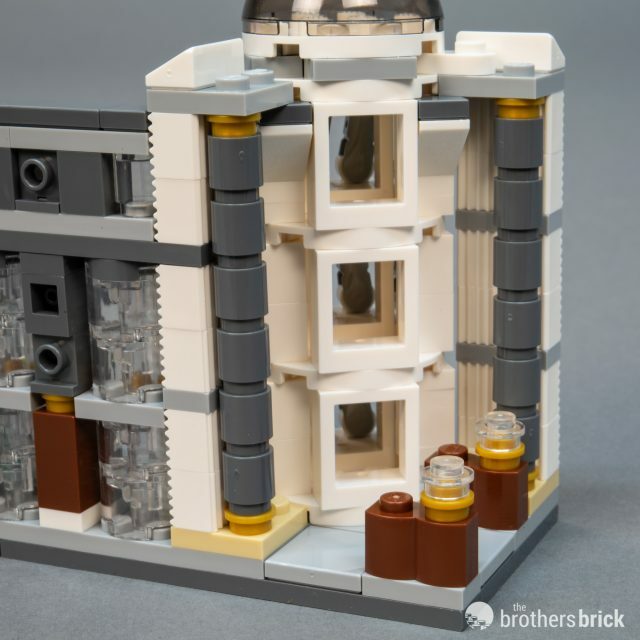 In the film, the corner window has narrow orange bands between the large floor-to-ceiling windows, but in the LEGO version both layers are represented with round 2×2 bricks. 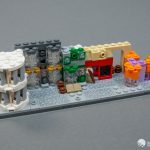 It doesn’t quite work as well as the rounded windows elsewhere in the model that are built with round 2×2 plates, but the color scheme and head make the shop recognizable nevertheless. 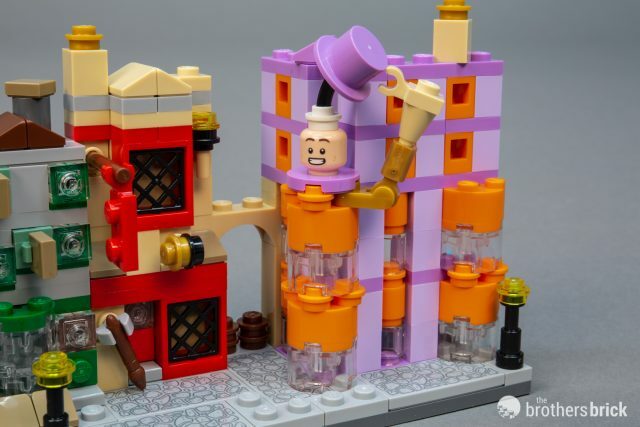 Rather than using one of the existing Weasley twins’ heads, the head is actually from Robin in The LEGO Batman Movie (sans oversized eyeglasses). 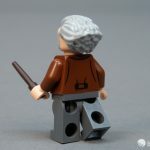 As such, the reverse side of the head is printed with an alternate expression. 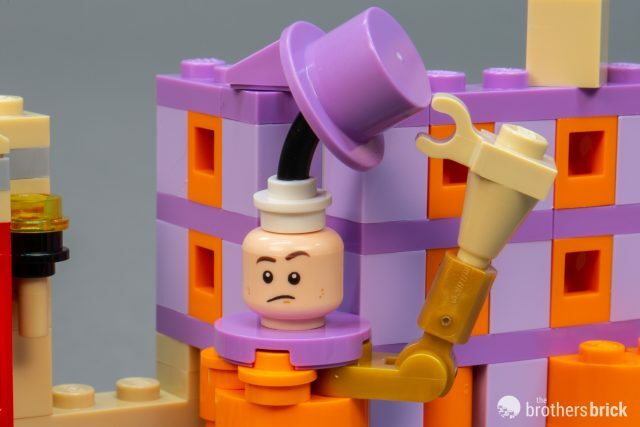 The hat is attached to the head via a black sausage piece. 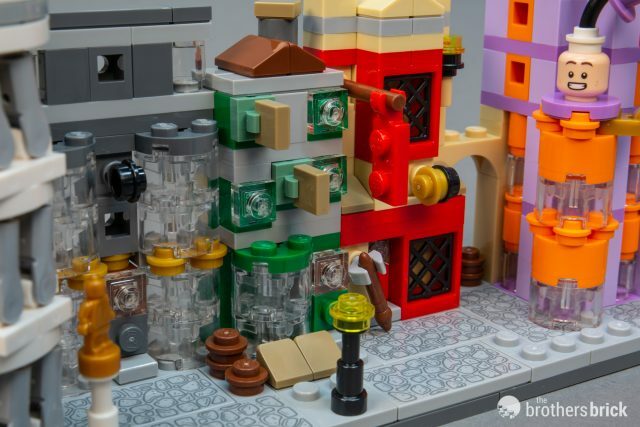 The corner buildings on either end of the alley have interiors, with stacks of colorful goods in the Weasley store. 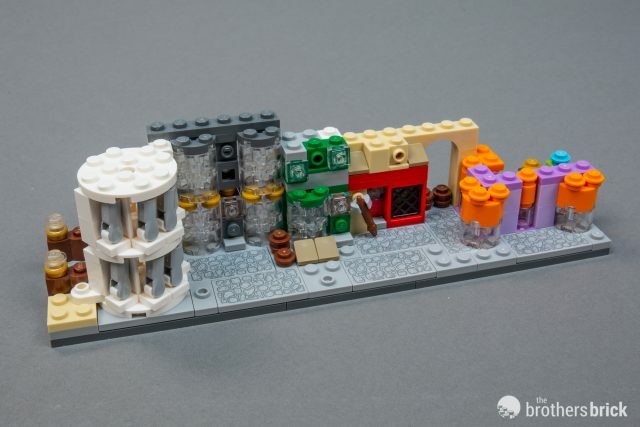 The center of the alley includes the smaller shops. 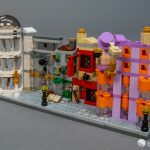 Ollivanders is the simplest, without much in the way of adornment on the facade. Next door, Flourish & Blotts has angled stands of books out front, represented by 1×1 cheese slopes in dark tan. Signs advertising books stand out from the building — 1×1 tiles attached to clip plates in what is sure to be called an “illegal” connection by some builders. 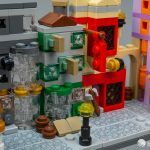 Finally, Quality Quidditch Supplies includes a hanging banner as well as a broom out front, represented by an unprinted minifig paintbrush. 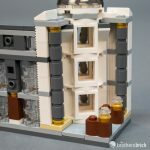 Like the Weasley twins’ store, Gringotts also features a small interior in back, with what I presume are desks with lamps. 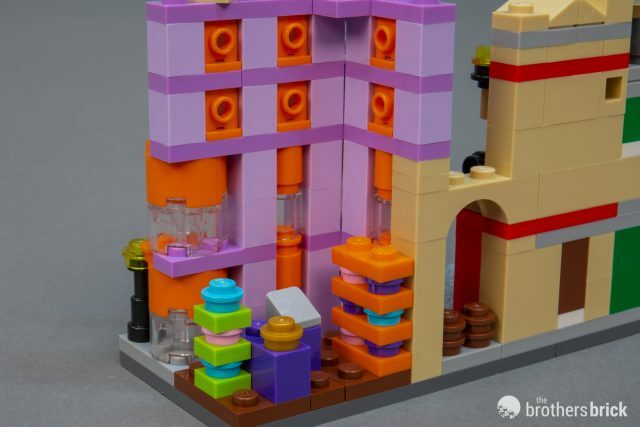 Despite the interior details behind the facades of the two larger buildings, the back of the set is mostly just the back of the bricks of the facades, since the buildings are mostly one brick deep. 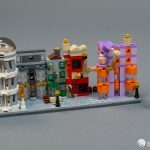 Like Hogwarts Castle, this microscale piece of Harry Potter’s Wizarding World includes a representative character in addition to the small buildings. 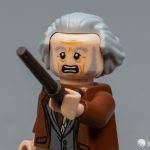 The unique character in this set is Garrick Ollivander, the proprietor of a wand shop who is pivotal to Harry Potter’s life on several occasions. 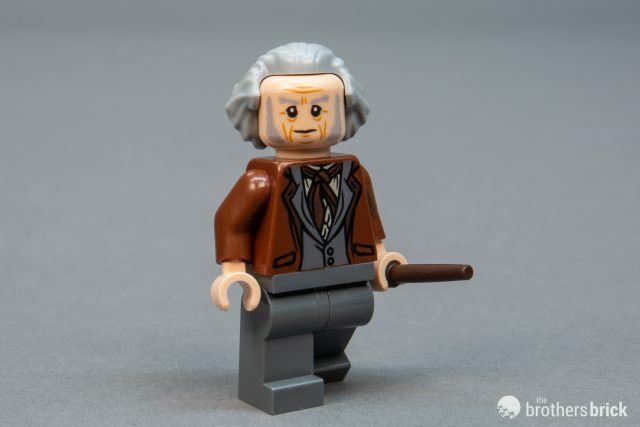 The minifig is unique to the set, and features the character as played by John Hurt, with long hair and sideburns. 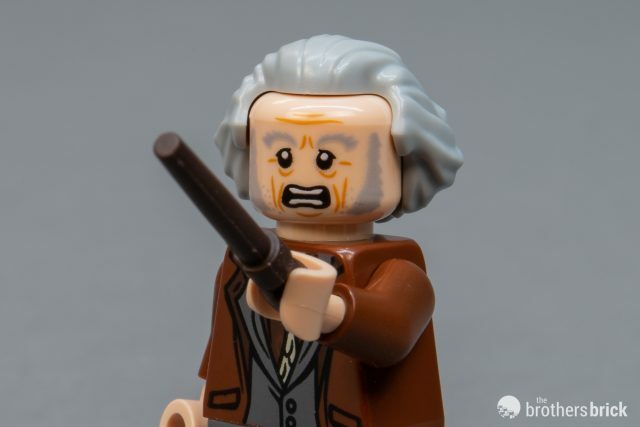 Ollivander has a dark brown wand that comes on a sprue, so there’s an extra in the set. 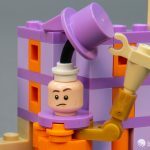 His head is reversible, with a slight smile on one side and an angry/determined/fierce expression on the other. 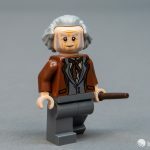 His torso is also printed on both sides, with a loose neck kerchief tied over a white shirt, with a gray waistcoat and brown overcoat. 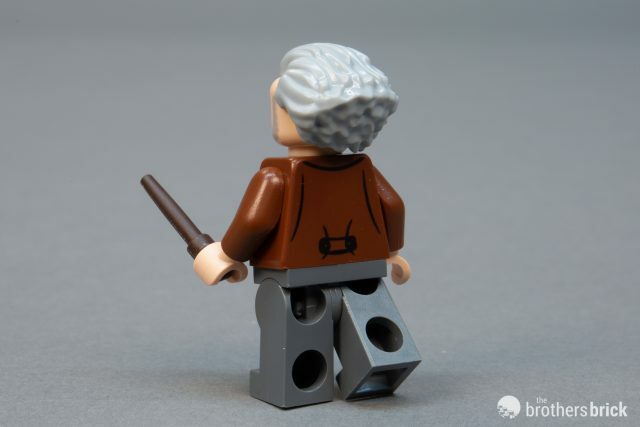 The old-fashioned overcoat design continues around to his back. 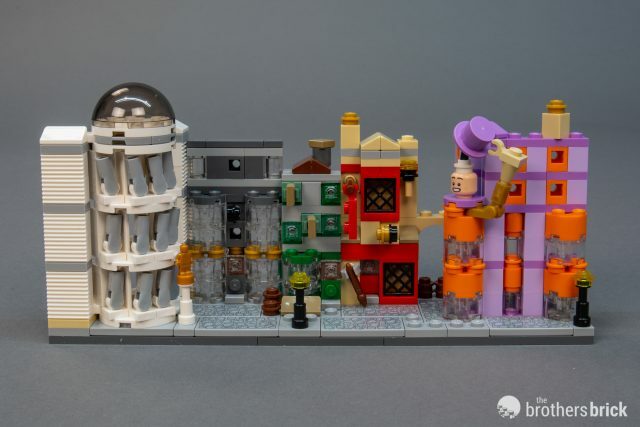 Getting a set worth $30 for free that includes unique printed parts and a unique minifigure shouldn’t require too much convincing on our part. 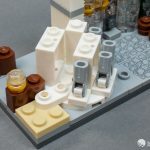 While the designs of the microscale shops aren’t quite as innovative as some of the amazing entries in our recent Microscale Magic contest, they’re consistent with the aesthetic of 71043 Hogwarts Castle. 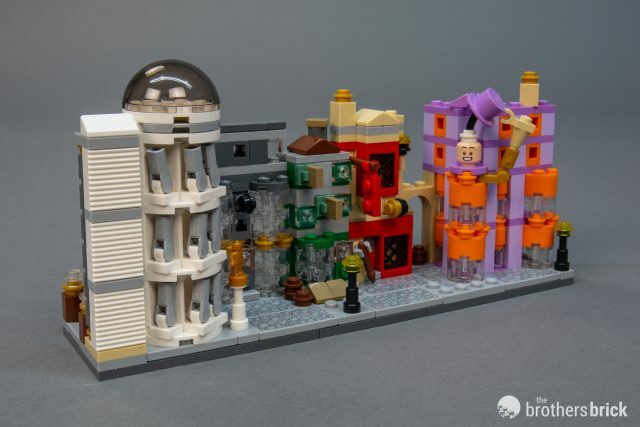 This leaves us hopeful that LEGO will produce more locations at this scale, like Hogsmeade Village or the Burrow. 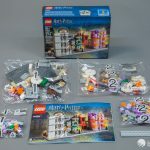 Even if you’re not a die-hard Harry Potter collector, this set has a lot of small, useful parts in interesting colors, along with printed cobblestone tiles and a great minifigure. 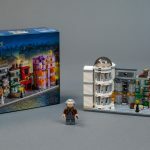 We highly recommend picking this set up as part of any order over $99 when it becomes available next Friday, November 9. 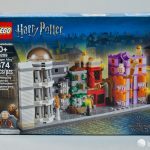 Although orders without other Harry Potter sets seem to qualify, if you haven’t yet picked up the July 2018 Harry Potter sets or the August Fantastic Beasts sets, now might be a good time to do so, since they’re back in stock again after the initial rush. We’ll share a reminder when the special offer begins next week. 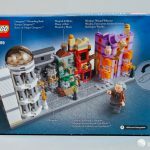 40289 Diagon Alley includes 374 pieces and one minifigure. The set will be available between November 9 and 21 (or until supplies run out) as a free gift with purchase on orders over $99 USD. Upsetting that it is a free with purchase. I can’t afford $99 but around $30 is far better. 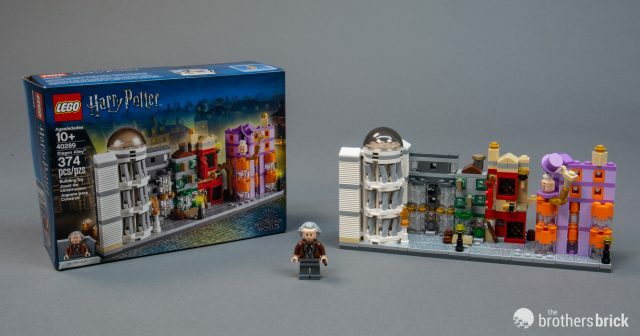 So I wish this was not a promo set.